“Remember that when you leave this earth, you can take with you nothing that you have received – only what you have given”. 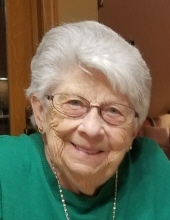 Marie “Mesee” Louise (Semling)Malm, age 94, of Merrill, passed away on Tuesday, January 29, 2019 at Bell Tower Residence in Merrill, Wisconsin. Marie was born May 29, 1924, in Merrill, daughter of the late Mary Therese Semling and Emil Semling. She married Alan Malm on June 30, 1951, and together, raised a family of 11 children. He preceded her in death on January 1, 2018. Marie graduated from Our Lady of Holy Cross High School in 1942. She graduated from St. Francis College, Joliet, IL in 1946 with a Bachelor of Arts degree in Music. She then taught Music Appreciation, Choir, Art, Voice Lessons and Freshman English at Holy Cross High School in Merrill from 1946-1948. Marie then returned to school at DePaul University in Chicago earning a Masters Degree in Education in 1950. She returned to teaching in Tomahawk, Wisconsin where she taught Grade School and High School Choirs and provided private voice lessons. Marie is survived by her children, Jeanne (Craig) Nienow, Merrill, Christopher Malm, Merrill, Gregory Malm, Merrill, Mary (James) Litschauer, Merrill, Peter (JoAnn) Malm, Greenfield, IN, Jonathan Malm, Merrill, Virginia Loew, Eau Claire, Therese (James) Janachione, Gilberts, IL, Eric (Lori) Malm, Merrill, and Kathleen (Craig) Arritola, Fox Lake, IL, her grandchildren, Noelle (Raja) Soi, Zachary (Adrienne) Nienow, Claire (Rob) Kitson, Andrew (Angie) Malm, Adam Malm (Melanie Dubnicka), Kathryn Malm (Jamie Lewis), Keith Malm, Patrick Malm, Sherry Cummins, Bryce, Anna and Mae Litschauer, PJ (Julia) Malm, Cora (Jon) Wolfarth, Maria Malm, Alex (Noriko) Malm, Charlie Malm (Scott Malinowski), Nick (Nina) Malm, Allison (Mitch) Smith, Emily (Dan) Backes, Megan and Sarah Loew, Michael (Torie) Janachione, Kara (Sam) Childs, and Brittany and Austin Malm; her great-grandchildren, Ilina and John-Paul Soi, Collins Nienow, Madison and Taylor Malm, Connor and Carson Malm, McKenzie and Emma Cummins, Jackson and Stella Malm, Harrison and Riese Wolfarth, Penelope and Lear Malm, Elijah and Adelynn Smith; sister-in-law Faye Semling; her AFS family in Portugal; and many nieces and nephews. Marie was preceded in death by her parents; her husband Alan; son, Vance ‘Benji’ Malm; sisters Marion (Noke) Lillicrist, and Virginia (James) Harding, and John Reynolds, brothers Don (June) Semling, and Jack Semling; and sister-in-law Jeanette Malm, and brother-in-law Robert (Elizabeth) Malm. Marie was the Director of the St. Francis Family Choir for many years. She served on the Marriage Preparation Committee at St. Francis Catholic Church. She was a member of the Merrill Jaycettes, Merrill AFS (American Field Service) Chapter and a founding board member of the Merrill Area Concert Association. Marie loved to play the piano and sing. She enjoyed singing at various clubs and social group events in Merrill during high school. She sang at many churches in the Chicago area while a member of the chorus at DePaul University. She was also a talented artist drawing and painting mostly for pleasure. For several years she dedicated herself to painting nativity sets for each of her 11 children and their families. They received them as Christmas gifts. Marie was a proud and loyal booster of the people of the Merrill and Community at large. She spent her childhood summers enjoying time at her parent’s cottage on Tug Lake. Adult summer years were spent at the family’s A-Frame on Tug Lake where she hosted and enjoyed many events with family and friends. Marie’s family would like to thank all her caregivers, the staff at Bell Tower Residence, Holy Cross Sisters, Dr. Donald Evans, Andrea Heller NP and Aspirus Comfort Care & Hospice. The family requests that in lieu of flowers and plants, memorials could be sent to River Bend Trail-Marie and Alan Malm Memorial, Merrill Historical Society, Holy Cross Sisters or St. Francis Xavier Catholic School. The Mass of Christian Burial will be celebrated at 11:00 A.M. Monday, February 4, 2019 at St. Francis Xavier Catholic Church, Merrill. Father Chris Kemp will preside. Burial will take place at St. Francis Xavier Cemetery, Merrill. Visitation will be held from 2:00 P.M. until 5:00 P.M. Sunday, February 3rd at the Taylor-Stine Funeral Home, Merrill. To send flowers or a remembrance gift to the family of Marie L. Malm, please visit our Tribute Store. "Email Address" would like to share the life celebration of Marie L. Malm. Click on the "link" to go to share a favorite memory or leave a condolence message for the family.